Karlene Burrell-McRae credits her childhood with shaping her zest, passion, commitment, and sense of purpose. Having lived a “joyful and secure” childhood in Jamaica until the age of 10, Burrell-McRae says her world shifted when she moved to the United States. For the first time, she had to think about issues of race, class, and belonging. Today, Burrell-McRae works to help students grapple with similar questions in higher education. As the dean of the college at her alma mater Colby College – a position she never imagined herself in growing up – Burrell-McRae reflects on her trajectory and the lessons she’s learned along the way. Strong proponents of education, Burrell-McRae’s parents enrolled her in Gateway – a program for first generation students and students from low-income backgrounds interested in STEM. Despite struggling in math and science, Burrell-McRae had aspirations of becoming a psychiatrist. She now attributes this goal to having limited exposure to different professions and feeling compelled to pursue a career deemed respectable by her family. By the time Burrell-McRae went to college, she had decided to major in psychology. She laughs as she recalls withdrawing from Introduction to Psychology – the only “W” on her Colby transcript – which impeded her from taking any other courses in the psychology department. She says her struggles in psychology opened the doors to the beauty of a liberal arts education. After taking a variety of courses and studying abroad for three semesters, Burrell-McRae graduated with an anthropology major and plans of attending law school. 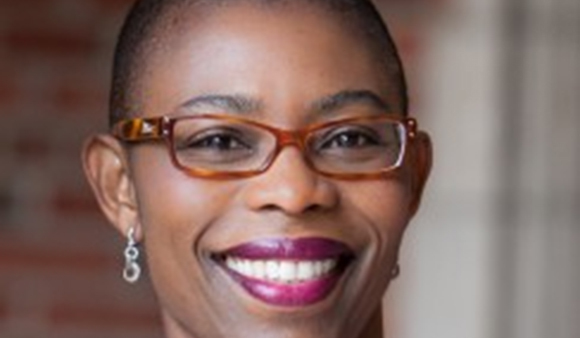 While beginning her law school applications, Burrell-McRae remembers something in her asking “is this what you really want to do?” Anxious about debt, not passing the bar exam, and the competitive nature of law school, she began to think about her work as a Colby student around access, equity, and inclusion. It was then that Burrell-McRae discovered what is now not just a career, but her passion. She went on to earn two master’s degrees and a doctorate from the University of Pennsylvania where she also worked in student and multicultural affairs. Before working at Colby, she served as the associate dean of students and executive director of the Center for Identity and Inclusion at the University of Chicago. She also spent time as the Dean of the Junior class and director of the Black Cultural Center at Swarthmore College.